Out on a loose lead neighborhood walk with German Shepherd Gunnar. Creating rock solid obedience that you can safely rely on is what we do best here at Kabler School For Dogs. Once your dog begins their On and Off Lead training courses there is a path that we take from novice to expertly trained dog. The journey to training a dog to rock solid reliability is about teamwork, fun practice sessions, and carefully following the Kabler School For Dogs training roadmap. Rock solid training begins by building a bombproof foundation. Foundation work teaches your dog how to respond to obedience requests with motivated energy. In the beginning, we want your dog to understand that following through with obedience brings reward. Short and fun training routines are the name of the game when building your foundation. Ending your dogs practice sessions while your dog is at their peak will make your dog always excited to train. Another strategy during the foundation phase is to switch back and forth between training and play. Punkin and Ayla out on an off leash training walk. Off leash training successfully finishes your dog’s training. If your dog has behavioral issues like leash reactivity or fearful anxiety we recommend that counter-conditioning be started alongside the foundation phase of training. By using these powerful techniques consistently you can make noticeable changes in your dogs behavior. Counter-conditioning adjusts your dogs energy allowing the coming training phases to take root faster and with more success. The goal of counter-conditioning is to soften behaviors so that the training program can progress with less stress. The next step on you and your dog’s journey to rock solid obedience is the guidance phase of training. There are many ways of communicating with your dog including voice requests, hand signals, and body language. During this phase we emphasize communication using the leash. It’s important that your dog understand that a pull on the leash actually means something. Just like a horseback rider communicates with his steed using the reigns we are going to send our dog obedience requests using the leash. Once your dog understands and responds successfully to leash guidance we are ready to continue our training journey to the reliability stage. German Shepherd Maggie being rewarded for a long down stay request during a park training session. When your dog clearly understands how to respond to the different leash requests it is time to build their ability to reliably listen to your direction. Following through with commands on one request, longer sit and down stays, and consistent loose lead walking are some of the highlights of this training stage. It’s important to train in low to moderate level distraction environments as we strive to achieve the goals of the reliability phase. Once our dog is performing with accuracy it’s time to progress into the finishing phase. During the finishing phase of training our goals are to make sure the training will work for us anywhere. Some trainers call this the distraction proofing phase. Now that your dog is demonstrating their new training skills with ease it is time to put the training to the test in increasingly higher distraction settings. As your dog learns to respond successfully in higher distraction settings you will notice a settling in your dog that actually deepens the canine/human bond. Seeing that your dog will enthusiastically respond to their training requests regardless of the environment or situation you will know you have achieved rock solid performance with your newly trained best friend. 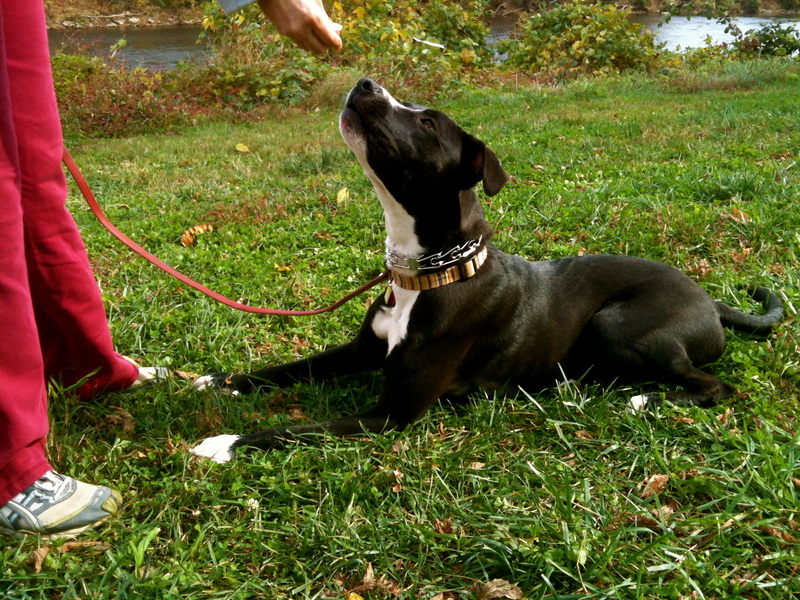 Ayla and Punkin practice their long down stay at the park during their Residency training course. 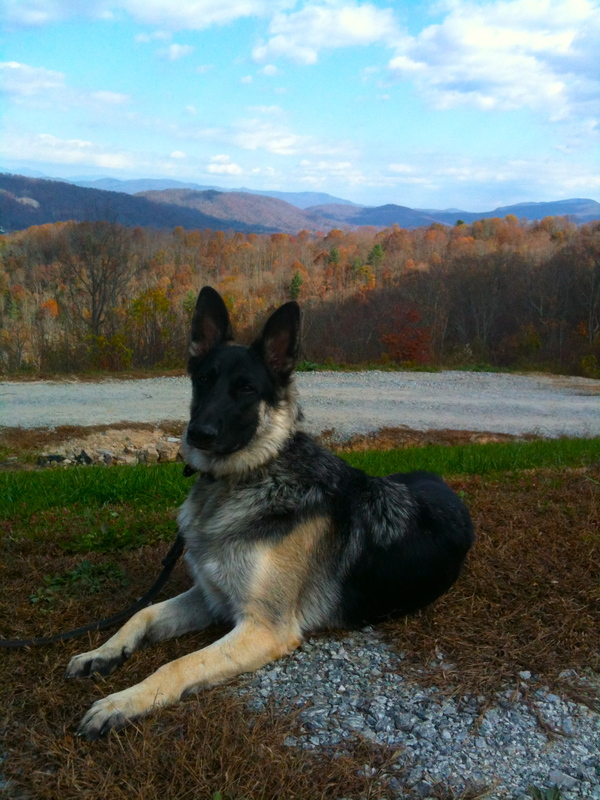 Please call (828) 337-5792 for more information about the unique approach to training at Kabler School For Dogs. Locations in Asheville and Tricities, TN. Handsome German Shepherd Dog Eli practicing a Down & Stay request during an in home training session. Gorgeous Doolin accepting a reward from her Guardian for a successful Down & Stay request. 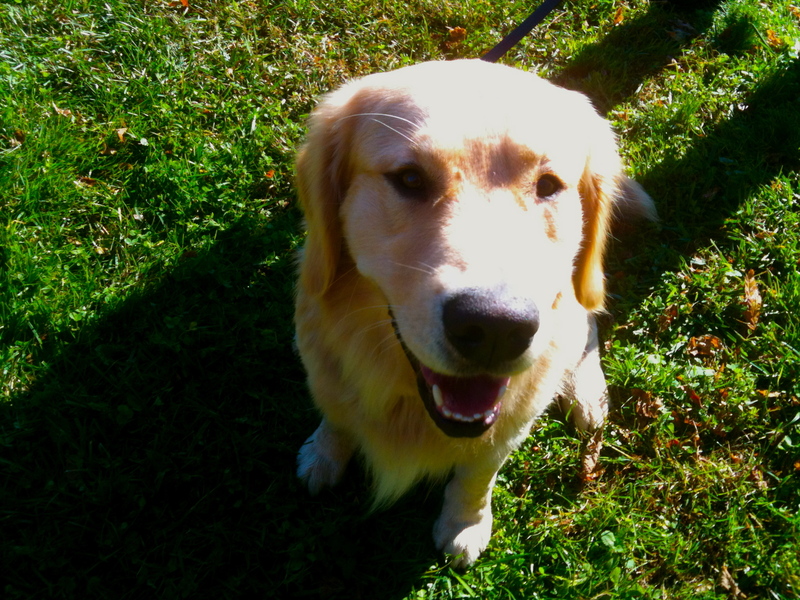 At Kabler School For Dogs we have been having an awesome Fall training season. My apprentice Kim and I have been successfully finishing up with our Summer training cases. Tenshi and Jack both graduated through the Residency Training Course. Eli, a very aggressive German Shepherd, has been successfully de-conditioned in his response to strangers and his untethered obedience is coming along nicely. Kim’s training dog Iko and his Guardian are getting close to Tethered graduation. We are really excited about all of our graduates– and beginning training with lots of new Guardians and their canine companions. Kim and I would like to welcome all of our new clients to Kabler School For Dogs. Obi is a gregarious Golden– The highest goal of obedience is to shape and grow the relationship between Guardian and Canine companion. Kabler School For Dogs is proud to announce our Puppy Preschool Class. The training of the young pup is often overlooked by novice dog Guardians. These early weeks are actually critical to the healthy development of your best friend. Proper training and socialization from 8-20 weeks can successfully prevent serious behavioral issues later. Puppy Preschool also includes house training, crate training, redirecting play biting, reward based obedience, and fun games you can play with your new dog. New puppies are welcome each week– hope to see you and your new pup at class. To enroll call Kabler School For Dogs at (828) 337-5792.